Warner Bros.' upcoming fantasy adventure Knights of the Round Table has officially begun production. Guy Ritchie, who rebooted Sherlock Holmes for the studio, is behind this latest reiteration of the King Arthur legend. 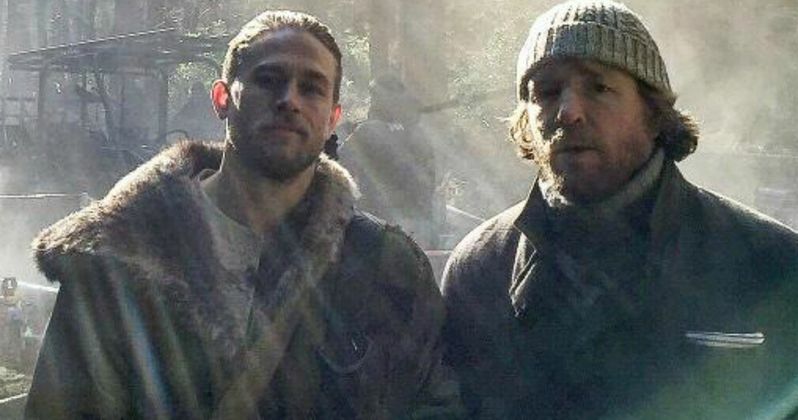 He sent out a Tweet this morning, which gives us our first look at star Charlie Hunnam on set. The bold new story introduces a streetwise young Arthur who runs the back alleys of Londonium [sic] with his gang, unaware of the life he was born for until he grasps hold of the sword Excalibur-and with it, his future. Instantly challenged by the power of Excalibur, Arthur is forced to make some hard choices. Throwing in with the Resistance and a mysterious young woman named Guinevere, he must learn to master the sword, face down his demons and unite the people to defeat the tyrant Vortigern, who stole his crown and murdered his parents, and become King. While we don't get a look at them here, Charlie Hunnam will be joined by Astrid Berges-Frisbey, Jude Law, Djimon Hounsou, Eric Bana and Mikael Persbrandt. The screenplay was written by Joby Harold, who is producing with Akiva Goldsman, Tory Tunnell and Guy Ritchie. As of now, the film is scheduled to hit theaters on July 22 of next year. But it faces some stiff competition in both the Power Rangers and Ghostbusters franchise reboots. Who do you think will win that weekend? Take a look Charlie Hunnam seen here in one of his medieval costumes...Does he have what it takes to defeat a couple of kids in super powered alien costumes and four woman who hunt malevolent spirits for a living? Can King Arthur and Amy Schumer Conquer Guardians 2 at the Box Office?